This is the UK’s premier event for trade, building owners, occupiers, and the general public covering sustainable build, energy, transport and technology. It takes place at the Brighton Centre on Friday 14th and Saturday 15th June. We are to be there with our recycled stand on Saturday 15th. You’ll find us on the 1st floor in Seminar area 3, floor plan here. Pedro and his recycled robots will there playing green games and sharing ideas about how people can lead a greener life, save money and help the environment. 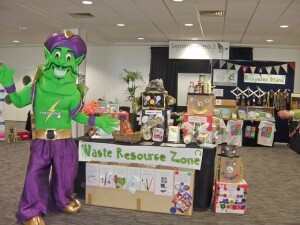 Our stand will illustrate how “there is no such thing as rubbish just a waste resource in the wrong place”. As well as green games using up-cycled materials we will be selling beautiful merchandise which the Philippine Community Fund (PCF) make out of our waste. This money benefits poor families in Manila, helping keep their children off the landfills and instead in the PCF school! 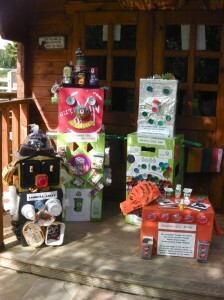 The Sussex Green Living recycled robots will be the main focus for the ‘Waste Resource Recycling Trail competition’. This will be a trail around the exhibition, all you and your family need to do is look out for Pedro the Sussex Green Living frog who will be clinging to waste resources, (otherwise known as recyclable packaging), on the stands around the show. As you spot the items write down the stand number and read the environmental fact about the waste resource. When you have found all 10 waste resources, simply answer the final question and drop off your competition entry to the Sussex Green Living recycled stand. There will be a great green prize for the winner! Water Conservation video aimed at 10-11 year olds. Energy for Waste – illustrating how landfill waste is now producing energy for the national grid. Sussex Green Living 10 sustainable living tips video. We are supplying a ‘Waste Resource Recycling Zone’ so bring along your recycling (things the council cannot recycle), see below. These recycled waste resources will financially benefit the William Penn Primary School in Coolham, West Sussex, Sussex Wildlife Trust and the Philippine Community Fund. Ask us to explain how you can set up a scheme to benefit your chosen charity, not for profit organisation or school. 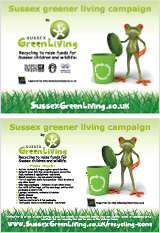 Or read more information about the Sussex Greener Living recycling campaign here. Baby wipe packaging bin – recycling scheme sponsored by Johnson Baby Wipes. Bring along any brand of baby wipe packaging. Baby fruit and vegetable food pouches bin – recycling scheme sponsored by Ella Kitchens. Bring along any brand of baby fruit and vegetable food pouches. Writing bin – recycling scheme sponsored by BIC. Bring along any old pens, ballpoint pens, felt tips, propelling pens, correction fluid, markers, regardless of their brand or material. Mixed food waste resources – including sweet biscuit wrappers, eco coffee refill packaging, plastic lids off of coffee jars, Tassimo plastic pots and outer foil packaging for coffee, tea and chocolate drinks, Activia, Actimel and Shape yoghurt pots and bottles (only Danone pots), plastic milk bottle lids (those with a 2 or a 4 in the triangle on the lid). Technology recycling bin – mobile phones, Laptops, notebooks, netbooks and tablets. Aluminium ring pulls bin – these can be recycled by the Council, however come along, see and buy beautiful merchandise which the Philippine Community Fund make with them! Find out more about the Eco Technology Show here. 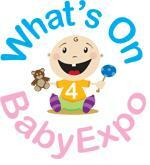 If you can’t make the 15th June, we are also going to Baby Expo Show at Brighton Racecourse on Sunday 30th June. This event will have over 150 exhibitors, fabulous marquee (hosting the stage area and exhibits), the Grandstand & Premier Halls, outside areas, displays & stalls, family-friendly catering + a very special Humphrey’s Corner event! You will find us in the Grandstand Hall on stand 127 and the Natural Parenting Recycling Zone will be on stand 141. Floor plan here. This entry was posted in Events, Green stats, facts & news. Bookmark the permalink.